Woof! Woof! Hello you guys! 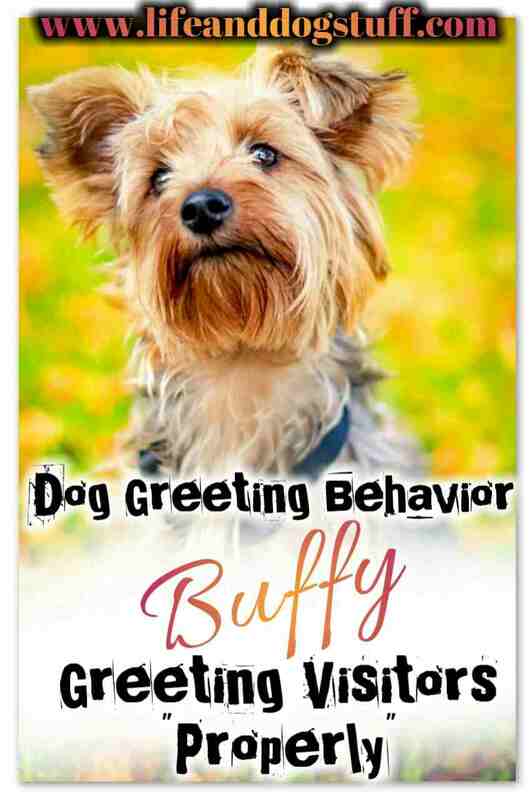 Polite dog greeting behavior is important if you want to make a good impression. My track record for welcoming guests into our home has not been good. Not good at all! Look! I'm not a people's doggie. Unless it's mommy and a few other humans. Fluffy, on the other hand, loves humans. She's way too soft. Making friends left and right. Unfortunately, I had to adjust my behavior and learn proper greeting skills. Mommy does not like the way I do things and my main job is to make her happy. Here are a few things I've learned about greeting intruders. I mean visitors! 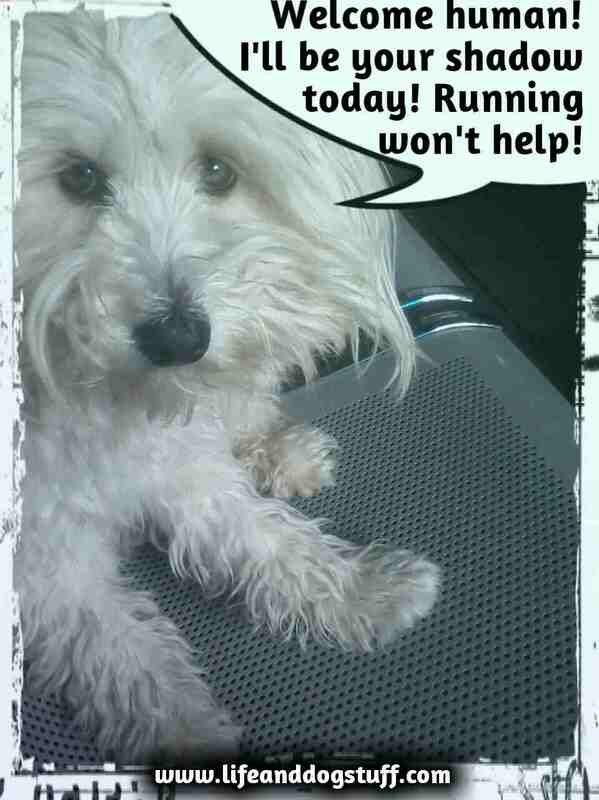 Alerting Renza is the first thing to do when I hear someone at the gate. I have a special bark for visitors that Fluffy copied. It's a mix between a bark and a howl. She tells everyone I taught her the bark but she actually stole it, you guys. I know yes. Very creepy! It's important to have different barking sounds or else your human will be clueless when you try to alert them. When someone knocks at the gate, we bark and mommy comes out to see who it is. She'll sigh a bit because uninvited guests are the worst. Call before you come people! How hard is that? Next, we need to make sure the visitors are welcomed properly. This is where things get a little awkward. I need to make sure they smell 'right' first by sniffing them. Fluffy starts jumping on them while I smell. 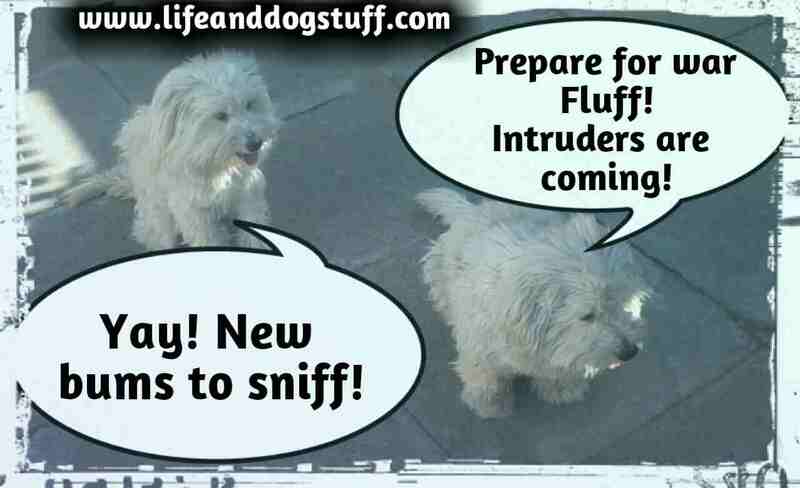 If they smell 'wrong' then I use my intruder alert bark on them. It's a little louder than my other barks. I practiced it a lot on Snowy when he used to live here. What?! He tried to take over. Mommy still thinks her Snow-snow is innocent. 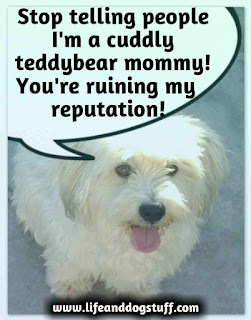 Snowy the backstabber has one bark for everything. Yep! Totally useless. But we used him as an amplifier when competing in barking competitions. Not completely useless. He's doing fine btw. Anyway, enough about him. Next, Fluffy dances at their feet and I'll let them know they're unwelcome. Yes, I know, I know the visitors are getting mixed signals from us but it's not my fault that Fluffy can't smell wrong humans! If they smell 'right', don't talk and make no eye contact then I'll let them pass. Look! I'm not going to lie to you. People with long coats freak me out. They are super shady and I'm sure they're hiding stuff. Not good stuff! Mommy says I'm being paranoid but I'm just protecting the pack. I do some coat pulling and there's some screaming. Hey! At least I don't bite. I'm harmless you guys! Biting is not my thing. Well unless it's in self-defense. One thing I do know is that biting for no reason is wrong. People can be super annoying but biting should be the last resort. Maybe a little growling is fine. Just a little. I growl or yawn if my personal space is invaded. Respect my boundaries and we won't have a problem. I invade your space, not the other way around. This is very important, you guys. I always make sure I'm in close proximity to the visitors. They normally get yummy treats so I stare at them until something falls on the floor or they share with us. Oh and continuing to guard the human while staring straight into a guest's mouth is a multitasking skill I'm really good at. Fluffy gets a bit creepy and stalks the visitors. There's a fine line between stalker, shadow and just hanging out. Fluff does not care about boundaries. She follows me everywhere and copies whatever I do. Like that crazy white female movie. It's not funny you guys! Help me! This is a sensitive topic. A lot of people don't like it when dogs jump on them. But mommy loves it! Well, I'm not sure how she feels about strange dogs jumping on her. I guess this is the main problem. If a dog you don't know runs to greet you, it's normal to get a little freaked out. If mommy does not want us to jump on her she'll just turn her back. Very rude yes. Fluffy will then hug her ankles tight and try to trip her. Not kidding! Don't worry! Fluff's cuteness makes up for her evilness. I'm not making this up. It's a universal law or something. Cute cancels out evil. Dogs are crazy. I'm crazy! Just calm down. Sure you'll get some dog hair on your clothes, you'll get invasively sniffed and you might smell 'wrong'. Smelling wrong could just be your fear giving off a stench or maybe you have another dog's scent on you. Like our neighbor that smells like his dog who bit me. I try my best to make sure he knows I was wronged. Mommy thinks it's funny that he's scared of a cuddly fluffy dog. Luckily they are moving in a few days. Good riddance! The pack will celebrate once they're gone. 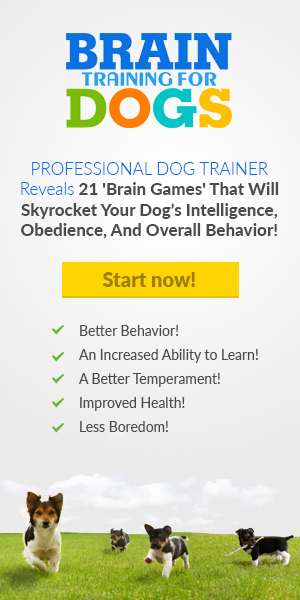 Dogs feed off a human's energy. Renza had to become crazier in order to match Fluff and my energy. Well, she was always nuts but hid that side of her. We showed her it's ok to be a little weird. It immediately made her our favorite human. Plus she's our food source. If Fluff gets too crazy then mommy uses a calm voice, head scratches or tummy rubs to calm her down. That's it, you guys. I've gotten much better at greeting visitors since Fluffy arrived. They seem less scared now. Just don't wear coats or stink then I'll welcome you with open paws. Time to go now. I just heard a car pull up. This next part might get unnecessarily loud but if they didn't want to be greeted by us then they should've stayed home. 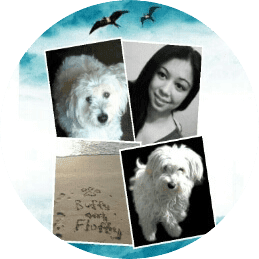 Pic credit: Pics of Buffy and Fluffy taken by Renza. Pixabay pics Renza edited. Never miss a blog post by Joining the fluffy pack for updates you guys. 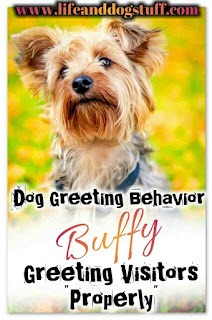 Please share if you think your friends will enjoy reading my Dog Greeting Behavior - Buffy Greeting Visitors Properly post. Thank you! Woof! Helpful info. Fortunate me I discovered your website by accident, and I am stunned why this accident didn't happened earlier!